http://itunes.apple.com/us/artist/phoebe-legere/id6262205 Phoebe Legere is a trans-disciplinary artist of Native American, French Canadian and Mayflower descent: she is a composer, a painter, and a poet. 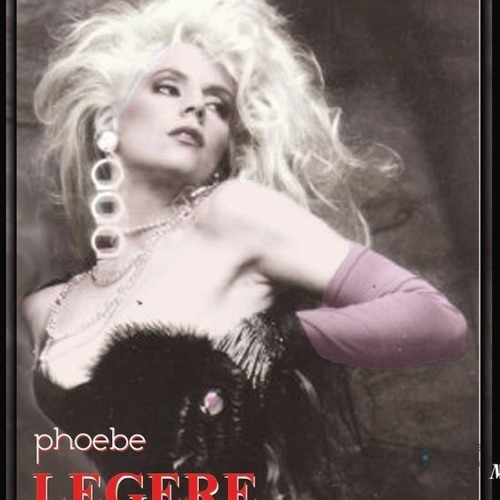 RockNYC describes Phoebe Legere as “a master writer of startlingly beautiful, heroic” songs. Phoebe Legere and her band 4 Nurses of the Apocalypse starred and wrote music for the movie Mondo New York. (Island Pictures) and opened for David Bowie on his national tour. Phoebe Legere starred and wrote music for Toxic Avenger; and wrote, scored and starred in the French movie Marquis De Slime where she played a female wrestler with superpowers who attempts to rescue the world from the Marquis de Slime, an Evil A and R man from the 18th Century. Phoebe Legere wrote "Hello Mrs. President!" a musical about about the first American President of color - She won a NYSCA award for her musical, “Queen of New England,” about the Massachusetts Native American holocaust and her ancestor, a spiritual and military Wampanoag Chief named Queen Weetamoo who, with her brother in law King Philip, challenged the Puritan establishment of Massachusetts. Legere and composer Morgan Powell were nominated for the Pulitzer Prize in Music for their work, The Waterclown. http://www.phoebelegere.com/waterclown.html Legere collaborated with the composers collective "The Tone Road Ramblers" to create 3 Epic poems set to music; Dark Energy (an Astrophysics oratorio with Eric Mandat), The Common Root of All Organisms, and The Prairie. All works are available on Einstein Records http://www.roulette.org In 2003, Legere invented a musical instrument called The Sneakers of Samothrace, a wearable computer for disabled children. In 2009 her song “Ultra-Romantic Parallel Universe” (co-written w Leo Abrahams) http://www.nyundergroundmuseum.org/ultraromanticparalleluniverse.mp3 was released on Mercury Records. Legere appeared in the children’s TV show The Naked Brothers Band (Nickelodeon.) and she played on the original cast album. She has nine CD’s of original music, including Children of the Dawn (Abenaki/Penobscot traditional music) and Last Tango in Bubbleland. In April 2011 Phoebe Legere wowed audiences at Lincoln Center when she sang a blues mass in Latin scored for 80 pieces. Her Oh La La Quintet garnered rave reviews this year in a 6 month sold out run on Broadway at the Iridium Jazz Club. In June she appeared at Resorts International in Atlantic City. Phoebe Legere recently returned from Europe where she starred in TV shows and played festivals for thousands. In August the versatile, multi-lingual virtuoso starred in Lance Tait’s newest film, Diapason, in Paris, France. Phoebe Legere makes and designs her own sets and costumes, and though her unique personal style has been imitated by many mass market American stars, her music remains an inimitable blend of elegant technique and populist joy. Legere speaks 5 languages including Mandarin Chinese. She is a student of Asian art and has been deeply influenced by Oriental aesthetics and philosophy. Using the Internet and Social Networks Legere has emerged as force for truth and creativity in the American Music Industry. Legere lives in New York City, Paris, Maine, New Orleans She is the Executive Director of the NY Underground Museum.